Adena Regional Medical Center Casualty Team members are shown working following Wednesday’s incident at the Ross Correctional Institute in Chillicothe. Corrections authorities in Ohio on Wednesday investigated inmate and staff exposure to drugs and chemicals at the Ross Correctional Institute in Chillicothe, with prison guards, nurses and inmates among the nearly 30 people treated. The incident began around 9 a.m. Wednesday when an inmate showed signs of a possible drug overdose, said patrol spokesman Lt. Robert Sellers. As officers and medical responders arrived, a total of 28 individuals, including 23 guards, four nurses and an inmate, were treated through the administration of naloxone, a drug used to combat overdoses caused by opioids such as heroin or fentanyl, Sellers said. They were taken to Adena Regional Medical Center in Chillicothe for evaluation. At the hospital, Dr. Kirk Tucker said the symptoms were consistent with exposure to fentanyl. He said an inmate was unconscious and not breathing on his own when he was admitted to the hospital Wednesday, but was expected to be fine. Most other patients experienced nausea, sweating, numbness, and drowsiness. Tucker said the sickest individuals were those who responded to the inmate’s bedside. One inmate was treated at the scene and not transported. Sellers said the patrol made 300 doses of naloxone available if needed. Agents with the U.S. Drug Enforcement Administration were among those investigating with the Ohio State Patrol, said DEA spokesman Wade Sparks. The majority of the patients treated within ARMC’s Emergency Department were treated and released following decontamination, assessment and treatment. Those showing symptoms were treated according to the symptoms with which they presented, including being treated with doses of Narcan, the news release said. One patient of the 24 was admitted for treatment and is in stable condition. A second patient was undergoing observation through the evening, the news release said. Contraband fentanyl, a powerful synthetic opioid, is suspected, possibly dispersed into the air by a fan, said Sellers, who emphasized investigators were still trying to determine exactly what happened. Fentanyl is considered several times more powerful than heroin, and has been linked to thousands of overdose deaths nationwide, sometimes on its own, but often mixed with heroin. Law enforcement officers routinely now put on gloves when responding to overdoses to avoid possible exposure. On Thursday, the DEA plans to release a new training video covering protections that first responders should take when the presence of fentanyl is suspected. Deputy Attorney General Rod Rosenstein was to announce the video, “Fentanyl: The Real Deal,” at a Washington news conference. A total of 31 inmates were evacuated from the unit where the Ohio prison exposure occurred, and a hazmat team from the Columbus fire department was summoned to clean up the affected area. In Ohio, contraband drugs including opioids are an ongoing issue for the Department of Rehabilitation and Correction and county jails. In May, a former milk deliveryman was accused of hiding marijuana, tobacco and cellphones inside milk cartons and smuggling them into a prison in southwest Ohio. He was sentenced to house arrest. In September 2017, the Richland County Jail in Mansfield started operating a body scanner to detect drugs. Officials there monitored 26 opioid-related withdrawals in July 2017. In February 2017, four inmates overdosed in two days at Pickaway Correctional Institution south of Columbus, requiring the use of CPR and doses of an anti-overdose drug as guards scrambled to revive the men. 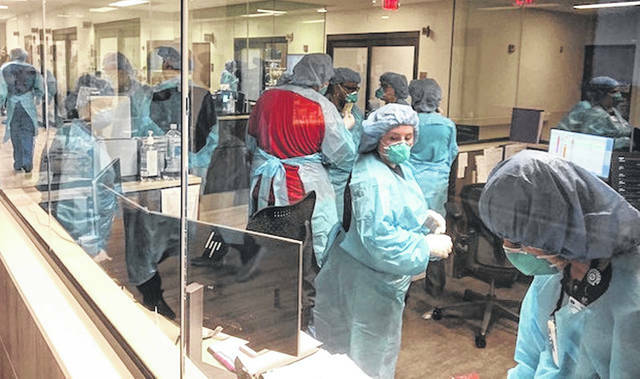 https://www.timesgazette.com/wp-content/uploads/sites/33/2018/08/web1_Adena-pic.jpgAdena Regional Medical Center Casualty Team members are shown working following Wednesday’s incident at the Ross Correctional Institute in Chillicothe.